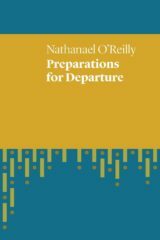 Preparations for Departure, Nathanael O’Reilly’s second full length collection, is an ongoing journey in which the poet enters the gaps between home and abroad, contentment and discontent, presence and absence, youth and age, the past and the present. These disparities emerge in a suite of fifty-nine free-verse poems spanning across his formative years growing up in small town Australia, to his most recent years living in America. Reflecting a life spent in diaspora, the poems transport the reader back and forth across oceans to land in cities of ruinous decay, preserved in the poet’s mind; to scenes of quiet urbanity and the endlessly silent screams which pervade; to beaches untrodden, and in which we may now see our footprints forever imprinted; the clatter and squalor of marketplaces and the drudgery of the quotidian. A constantly shifting collage of antonymous sights and sounds, these duopolies are best observed in the author’s mind. my needs and survival unthreatened. an alien from a golden dreamland. O’Reilly’s sense of diaspora is not only temporal, but also painfully internal. A victim of nostalgia and an unwitting tourist in his own youth, displacement perpetually plagues the evading poet. Though still capable of marking the parameters of home in his memory, his identity as an Australian of Anglo-Celtic origin turns his sights away from the antipodean land of his rearing, and temporarily toward the British Isles. One senses the poet’s hope of finding some outcrop of ancient rock to which he may find some purchase, and carve into the old-world soil of his ancestral home his own marking among the scratchings of his literary forbears. and earth across the Pacific. The Pacific ocean evokes profundity, and the depths to which the poet plunges to salvage these images, while its vastness suggests they are forever beyond the poet’s grasp in a muddling of past and present. The remarkably emotive poems in Preparations for Departure read lightly, yet leave deep and perennial tracings. O’Reilly, in a voice sculpted by the world he has ventured, captures the evasive and eternal nature of the wandering spirit; the constantly restless speaker leaves traces of himself across the pages, carefully crafting an impression of having just come and just gone, leaving the reader one page behind. To keep turning is to accept O’Reilly’s invitation and accompany him on his centrifugal journey forward over oceans and back across pools of thought that trickle into the past. As the speaker takes in the sights, the reader may ponder class, wealth, race and age from the not always welcome security of a temporal and or spatial distance. Though the gaps are ever widening, these poems are able to suspend and preserve observances, which continue to question inherited notions of contentment, belonging and identity. ZACHARY WARD graduated in a Bachelor of Communications, major in Creative Writing at UTS. His fiction appeared in the UTS Vertigo magazine.